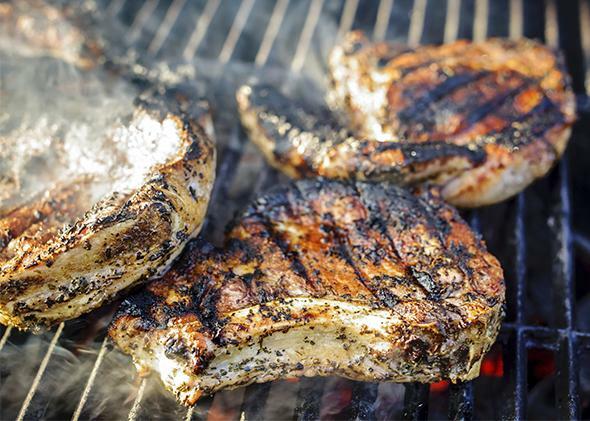 Cancer risk from grilled meat: Is it time to give up smoked and fried foods? It wouldn’t be crazy to give up grilled, smoked, or fried food. One day this might just be a memory. Grilling meats is an American tradition, but it’s not the healthiest thing to do. A growing body of research suggests that cooking meats over a flame is linked to cancer. Combusting wood, gas, or charcoal emits chemicals known as polycyclic aromatic hydrocarbons. Exposure to these so-called PAHs is known to cause skin, liver, stomach, and several other types of cancer in lab animals. Epidemiological studies link occupational exposure to PAHs to cancer in humans. When PAHs from a flame mingle with nitrogen, say from a slab of meat, they can form nitrated PAHs, or NPAHs. NPAHs are even more carcinogenic than PAHs in laboratory experiments. The reasonable conclusion is that grilling meat may be hazardous to your health. In subsequent decades, it has become clear that smoking isn’t the only problematic cooking method. Frying bacon, for example, produces significant levels of PAHs, probably due to volatilization of carbon in the bacon itself. An Iranian study published last year found that people who develop certain kinds of gastrointestinal cancers are more likely to have a diet high in fried rather than boiled foods. (The researchers linked level of browning to cancer incidence, thus reducing the likelihood that oil consumption was the culprit.) The FDA and WHO also remain concerned about the presence in food of acrylamides, a known carcinogen that forms from sugar and amino acids when cooked at high temperatures. Long-term studies are currently underway. The worrying implication is that cooking foods at high heat, even without active combustion, may be dangerous. None of these studies is definitive. It’s possible that other variables account for the correlations between cancer and cooking over a flame or at high heat, or that the carcinogenicity of PAHs observed in animal studies overstates the risk. But the risks are worth taking seriously. But the evidence suggests that huddling around a heat source and searing our food is a habit we should at least consider breaking. Before you accuse me of madness or subversion, let me lay out the case. This argument, like so many discussions about cancer, begins with tobacco. Insurance company statisticians first noticed the correlation between smoking and lung cancer in the 1930s, followed closely by Nazi physicians, who established the connection by the end of the decade. Hitler vehemently opposed smoking as a risk to public health long before his Allied counterparts did. (Being Hitler, he did manage to make it a racial issue, calling tobacco “the wrath of the Red Man against the White Man for having been given hard liquor.”) Two British doctors finally convinced the Anglo-American medical establishment that smoking caused lung cancer in a landmark article in the British Medical Journal in 1950. The statistics were soon piling up in both the United Kingdom and the United States, but the general consensus that a few cigarettes per day were harmless remained intact for many years. In a 1951 article on smoking during pregnancy, Better Homes and Gardens noted, “If you’re a heavy smoker, doctors advise that you cut down to a great extent, but you needn’t quit entirely, unless your doctor recommends it.” Consumer Reports wrote in 1957, “it would seem prudent to reduce cigarette smoking to less than a pack a day.” It wasn’t until 1964 that the Report of the Surgeon General finally and firmly declared that smoking was indisputably linked to the surge in lung cancer. By that time, epidemiologists had a complete picture of the long-term effects of the increase in cigarette smoking that began around the time of World War I. The conclusions practically drew themselves. Still, it took the public health community decades to agree that smoking in moderation is a terrible idea. Granted, the risk-reward equation for smoking differs from that of grilling or frying meat. Eating is a fact of life, and grilled and fried meats are a major part of the standard American diet. And the link between PAHs and related substances and cancer is nowhere near as clear as the link between tobacco and cancer. From a 1950s perspective, however, cigarettes weren’t that different. The annual consumption of tobacco was approximately 12 pounds per capita, and 80 percent of men smoked cigarettes at least occasionally. Smoking was an important social practice, and, for many, a reliable way to relieve anxiety. Although the link between smoking and lung cancer was evident by the end of the decade, few people recognized that tobacco would become the leading cause of preventable death in the United States. Smoking cessation seemed unnecessary and unwise, if not unfathomable. Giving up grilled, smoked, and fried meats seems equally bizarre today, but population-wide changes in dietary staples have dramatically affected cancer rates in other parts of the world. In the early 1970s, liver cancer killed nearly one in 10 adults in Qidong, China, a region located at the mouth of the Yangtze River. Two factors contributed to the astonishingly high prevalence: widespread infection with Hepatitis B, and food contaminated with aflatoxin. The soil in Qidong didn’t support rice cultivation, so the population relied on corn. Growing and storage conditions encouraged the growth of a mold that produced the potent carcinogen. When food trade between regions opened up, the residents of Qidong largely switched to rice. By the late 1980s, exposure to aflatoxin in the area had dropped more than a hundredfold, and the liver cancer rate has halved. So, should you throw your charcoal grill away and bring out the Crock-Pot this Memorial Day weekend? The evidence to support such a move may not be there—yet. The EPA is developing relative potency factors to define the cancer risk of exposure to PAHs, but it’s difficult to clearly define the carcinogenicity of an activity like grilling and eating a steak. Blasting genetically-streamlined animals with carcinogens in a laboratory environment is easy enough, but human exposures to PAHs are complicated by differences in ventilation and cooking temperatures, among other variables, and the effect of PAHs is almost certainly mediated by factors such as other foods in the diet and genetic diversity. You probably don’t want to turn yourself into the neighborhood Cassandra. On the other hand, Cassandra was a visionary, if not a particularly popular one. All I’m saying is that, if you’re the sort of person who likes to say, “I told you so,” this may be a golden opportunity.